What would the user type in order to get to my site? Does my competition use the exact same keywords and title tags? How can I create a search niche that others aren’t considering? These are great starting questions. Make sure to do your research and install the proper tools on your sites. Google Analytics and Webmaster Tools are becoming more and more integrated every day. When you add new pages to your site, submit them to Google, Bing, and Yahoo. But first and foremost do research on your competition!! Research is a key part of SEO. You can add tags and titles to every part of your site and still not have good results. It certainly helps to tag your site correctly and isn’t something to overlook, but you HAVE to consider what others are doing in the same space as you. If you have a niche market already, you’ll probably do very well. In fact, I recommend creating your own niche market in order to do well. The perfect example is a client I helped in the heater manufacturing business while working for Leinicke Group. He had a heater that worked indoors and had a very specific usage. It was manufactured for indoor yoga studios. Doing some research, we were able to buy www.HotYogaHeater.com. When searching for “Hot Yoga Heater” there were hardly any manufacturers in that space. It was mainly Yoga instructors sharing their insights. This was the perfect market considering the boom in Hot Yoga Heater Studios. We prepared title tags, bought the url and specifically created the site around that niche keyword. Alongside the title tags, keywords, and descriptions we made sure he marketed the site using a brochure which linked to the site. He handed the brochures out to studios and within the first week he had already sold one of his heaters through the site. I think niche marketing is very important in todays vast world wide web. There are so many people using the web to sell products. You have to find a space that gets you attention. When searching for a domain name, always consider your keywords. If your domain name doesn’t relate to the keyword, consider purchasing a domain that does. You want to do so in a strategic way that supports your site though. DON’T cloak your site and have two identical sites out there. Google will find out eventually and knock your site down in the rankings. I always consider keywords and title tags when thinking about domains. When doing a google search, your domain and title tags are one of the most important elements for defining your keywords. Be careful in what you place there, and which tags you consider. If a certain keyword is being used everywhere by others, consider a niche keyword that others may not have thought about. There are plenty of keywords that are related to your search. Try to find relevant ones that others aren’t utilizing! Doing so will find an avenue that they may have missed. Also, make sure you do use the popular keywords, but don’t focus solely on the popular searches. Find a combination of search words that other sites aren’t using. 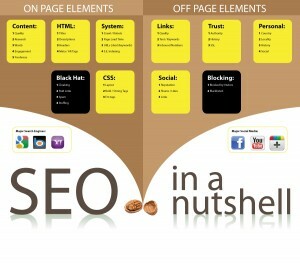 Consider this chart as well which is a basic summary of SEO.